“Mind over matter”… “Rule your mind or it will rule you”… You’ve heard motivational quotes like these before. Although they sound cheesy or trite, there is truth to these sayings. Your mind is powerful. 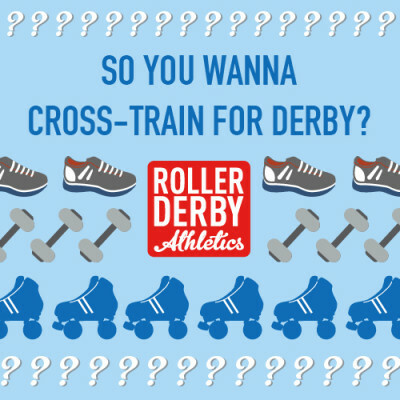 In a roller derby application, the thoughts that you have on the track or bench can have a big impact on your performance. That little voice inside your head can lead you to personal victories, or into defeat, depending on whether or not you know how to harness it and use it to help you. So how can you turn that little voice in your head into a tool to improve your performance? Let’s dive in! Most people talk to themselves (usually in their own heads) to help them process information or to help them interpret their thoughts and feelings. Think about the times you were by yourself and trying to remember the location of your keys or car. Self-talk can help organize the many thoughts in our mind. We use self-talk without thinking, so it’s important to recognize HOW we speak to ourselves. Positive Self-Talk is when your internal voice is framed in an uplifting or confident manner. The thoughts that pass through your mind are directed on what you ‘can do’ or ‘will do’. This positive internal dialogue helps program your brain to stay positive, focussed, and confident even through the challenges and struggles. There are two main reasons why a roller derby athlete might use positive self-talk: Instructional or motivational. Instructional self-talk gives you directions on what to do in a given situation. It could allow you to focus on small steps or specific cues when executing a technique or drill. The purpose of this type of dialogue is to help you stay in the present, and focussed on what you need to accomplish. Examples could include: “Bend your knees. Stay low and grounded” or “Keep the pack. Watch that blocker. No more than ten feet”. 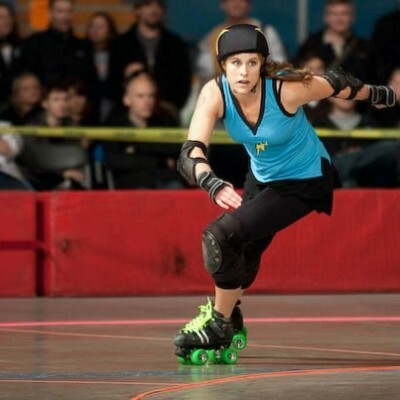 Roller derby athletes can use this type of self-talk to keep their mind focused on the game, and away from distractions, either in training or in competition. Motivational self-talk aims to motivate and encourage yourself through the task. The goal is to try to stay positive and confident in what you can achieve, and to give your full effort. Examples could include: “Last jam, Finish strong. 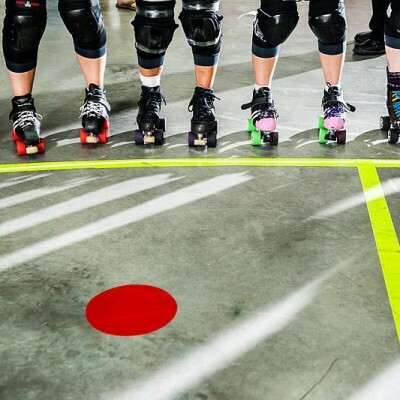 Give it your all!” or “No one has trained harder than me, I am ready!” Roller derby athletes can use this type of self-talk to build confidence or even to remove any unwanted competition stress. Positive self-talk, whether instructional or motivational, can be used at any time. It can help you maintain focus and motivation during a game, practice, or even during a strength and conditioning session. It can also help you stay positive and constructive when facing a challenge or when you’re out of your comfort zone (learning new skills). Positive self-talk is also a great way to help build confidence in skills and abilities. The possibilities are endless. Instead of wasting energy and time worrying about what you can’t do, you are able to focus on what you can do to develop as an athlete. Here are my top three tips for mastering the art of positive self-talk! We all have internal thoughts and opinions, especially about our skills, abilities, and performance. The worst thing a roller derby athlete can do is to have this internal dialogue without processing what is actually being said. If you’re not processing the message you’re delivering to your brain, then you might not even realize that you are hindering your progress. This is key in situations where you’re out of your comfort zone. This tends to be the moment where negative internal talk picks up because athletes are anticipating defeat. Pay attention to your internal voice! If you catch yourself talking in a negative way, try to stop that thought immediately. Change up that thought for something more constructive (motivational or instructional). Watch out for words like: Can’t, Don’t, Won’t, or No. When these words are used in a thought, your mind is focusing on the negative side of a situation. For example, ‘No more penalties! I won’t get anymore back blocks’. The message itself is trying to be positive in the sense that this athlete wants to avoid a certain action, but the athlete is still focusing on the negative. Look at the last words this athlete said: “back blocks”. A change for the positive could be: ‘I will be clean. Aim for hips!”. See the difference? 3. Believe in that Little Voice! Positive self-talk can really change your mindset and improve your mental game, but in order for it to be effective you need to believe the words your telling yourself. If you say “I can do this!” then you need to give your full effort during that moment. Remember that positive self-talk is not a magical solution. Just like any other training tactic, it’s a tool that needs to be developed and refined through practice. Got questions? Have your own example to share? Leave a note in the comments!